Derrick Rose is scary, scoring 39 points Saturday to rally the Bulls from a 10-point deficit in the last 3:38 for a 104-99 victory in Game 1 of the NBA playoffs. The Pacers’ Danny Granger crystallized just how frightening. 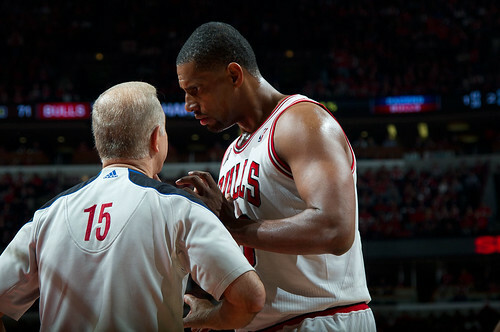 “With Chicago, no (you never think you have it won),” said Danny Granger, who led the surprising Pacers with 24 points. “With Derrick Rose, no. It’s like a crazy, stalker, ex-girlfriend. Every time you tell her you don’t want to talk to her, she shows up at your door again. 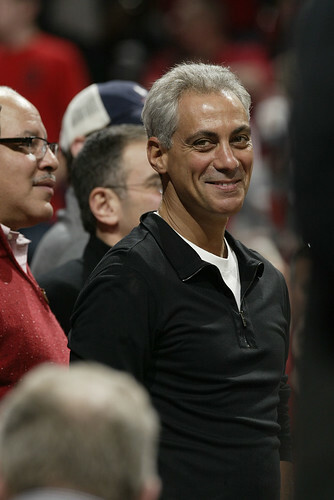 The Bulls will have plenty of time to demonstrate that, they hope. They were mostly outplayed by the only playoff team with a sub-.500 record, the Pacers shooting more than 50 percent through three quarters, 10 of 18 for the game on threes and outrunning the Bulls with fast break points. 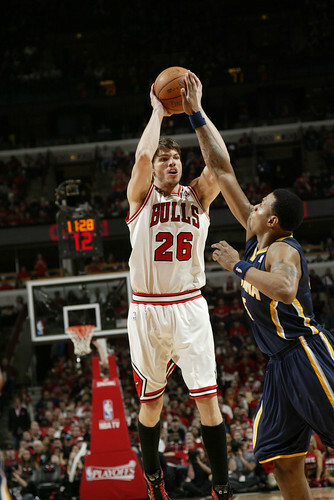 With Tyler Hansbrough blitzing the Bulls and Carlos Boozer with side pick and roll pop out jumpers for 22 points, the Pacers feel they exploited a weakness in the Bulls league leading defense as Hansbrough had 22 points. The Bulls, particularly Rose, went under screens too much, and Darren Collison had 17 points and nine assists with a pair of threes in firing the Pacers’ offense. 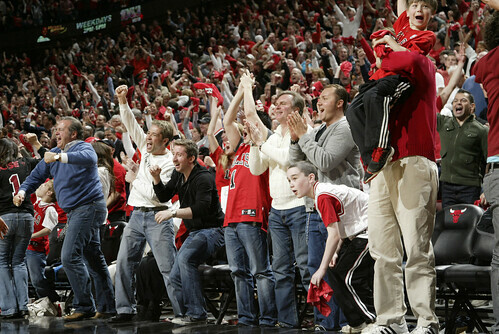 Until the close, that is, as an unusually animated Luol Deng, with a team high 10 fourth quarter points, began waving both arms to the crowd, urging them to respond with 4:52 left and the Bulls within 91-88. The Pacers would get a Granger jumper and two more Hansbrough scores, but no field goals in the last 3:38 as the Bulls closed the game on a 16-1 run. Deng, who was celebrating his 26th birthday, drew a technical foul for confronting Hansbrough after the hard foul on Rose that came after that Rose drive at 4:52 remaining. 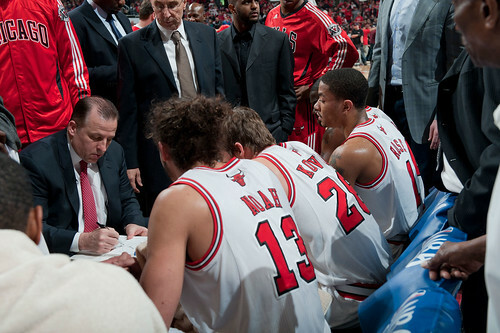 “It’s part of their game plan when Derrick drives to whack him,” said Deng. “That happened a couple of times in the first half. I don’t think it’s a dirty play. I just reacted. Like Rose. He just happens. 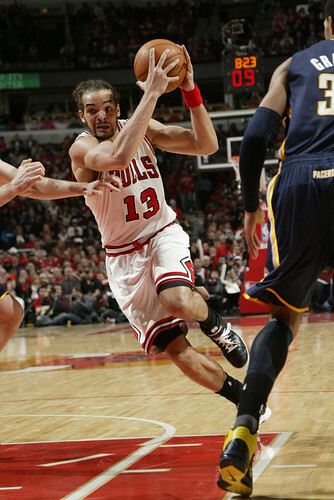 It was a chore all game for the Bulls as the Pacers matched every big play and every big shot. It wasn’t a very good Bulls effort with no second player really emerging until the close when Deng had two threes in the fourth quarter and 10 points and Joakim Noah finally got a runout dunk after a Hanbrough miss trailing 98-94 with 2:27 left. Noah also got a pair of blocks on Josh McRoberts on the Pacers last, desperate possession with quick jumping efforts that have been rare of late. 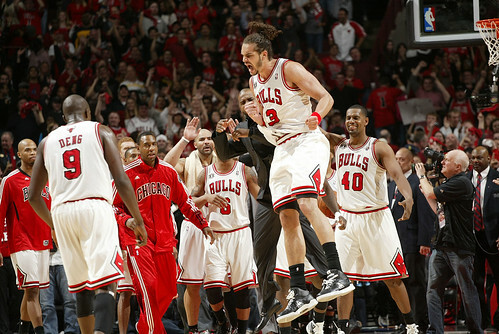 Noah celebrated like it was a 2009 overtime game and the Bulls breathed a sigh of relief. But in the end—and the beginning and middle—it was Rose, carrying an uncertain Bulls team with Boozer in foul trouble after a strong start and most everyone playing fairly tentatively. So Rose stepped into the void with 18 points in the first half, shooting eight of 10 free throws to keep the Bulls within 55-51 in a half the Pacers seemed to dominate more than the score. The Pacers went right to Roy Hibbert, and he had eight first quarter points. “I thought we gave Hibbert easy shots to start the game and that got then going,” said Thibodeau. The Bulls tried to front Hibbert, and the strategy only worked later in the game, though Thibodeau went more to Kurt Thomas as Noah struggled trying to contain Hibbert and then Thomas for Boozer late. 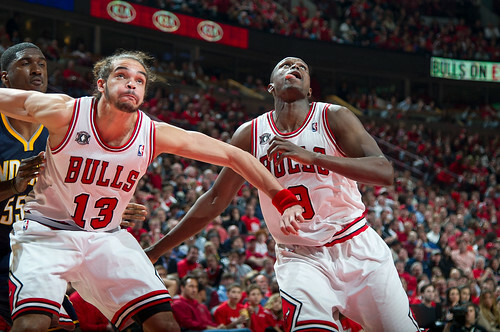 Collison surprised the Bulls early, though Rose had one nice block on him, the problem being it was from behind. The Bulls kept going under the screen on Collison, who was getting considerably more space on shots than Thibodeau demands. Indiana led 27-23 after one, and after a tough start for Kyle Korver when he got stripped twice as soon as he entered the game—“I guess your hand is the ball,” Korver said caustically after the game—Korver came on strong with seven points late in the second quarter and 13 for the game. 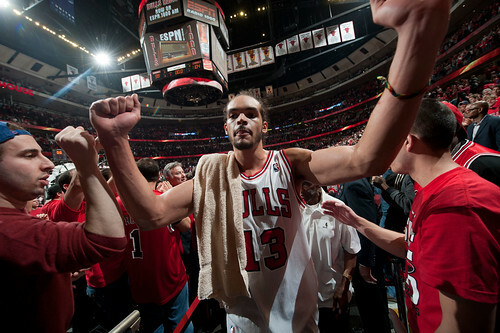 That included the three that gave the Bulls the final lead they never would surrender at 102-99 with 48.4 seconds left. The Bulls led Saturday’s game for just those last 48.4 seconds after trailing by double digits and up to 12 most of the third quarter. 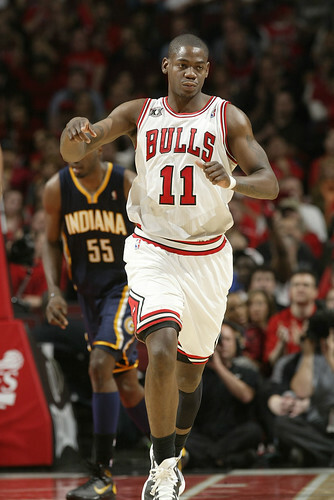 Deng had done a lockdown job on Granger in the first half. But the Pacers adjusted with Granger off more two man game action in the third quarter to find open spaces. 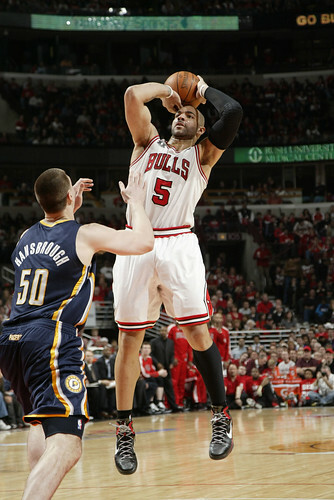 He had 10 points to keep building the lead for Indiana while the Bulls shot 35 percent in the third quarter with Boozer, Noah and Keith Bogans a combined zero for seven in the third. 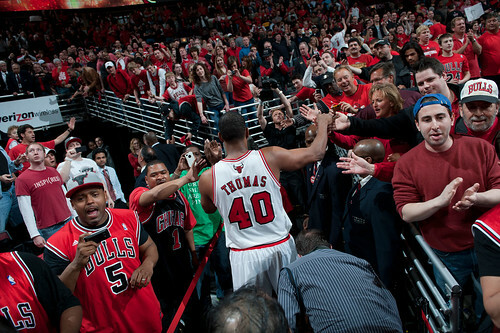 The Bulls went into the fourth trailing 79-71. It’s the story of the Bulls season if not the NBA this season, the emergence of Rose as the league’s MVP and perhaps the game’s best closer. 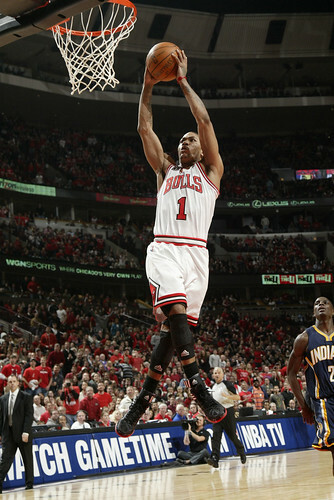 The Pacers could not keep Rose away from the basket all game as Rose got 21 free throws, making 19. He also had six rebounds, six assists and three blocks, though he was zero for nine on threes. Rose said he’d make them in Game 2 Monday. Who’s to doubt him? 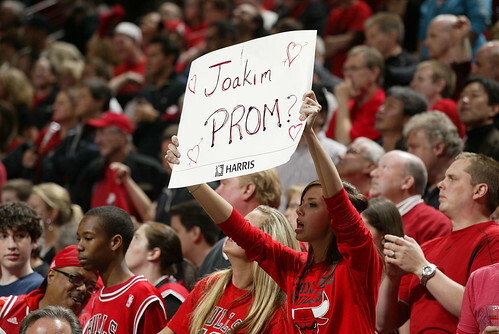 One of the big questions facing the Bulls this post season is who’ll step up to support Rose. Once again, it was multiple offensive contributions, if not anything exceptional from anyone, and lockdown defense at the end as this time the Bulls three straight times ran the Pacers off plays they’d called for Hansbrough or Granger down the stretch. And then it was Rose, who was being pounded all game not only at the rim, but coming into screens on defense with Jeff Foster and Hansbrough making sure Rose felt the bump. Hansbrough would feel his own bump late in the third as he appeared to be knocked cold by a Thomas elbow, though Hansbrough would return to the game. It did seem questionable as he was wobbling off the court, though he did play well and hit three big shots in the fourth quarter. And then Rose did that voodoo. 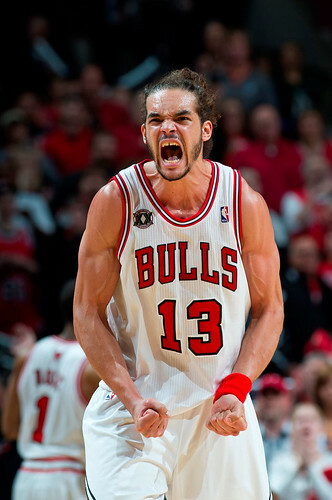 Rose scored or assisted on the Bulls last 12 points: A long pass for that Noah run out, a driving three point play to bring the Bulls within 99-97 with 1:50 left, a spinning reverse floater to tie the game at 99 with 1:27 left, a crosscourt pass to fine an open Korver for the three on penetration and then a pair of free throws for a 104-99 lead with 14.8 seconds left after Kurt Thomas, in for defense, got a Deng miss. Just another big win, as it turned out.